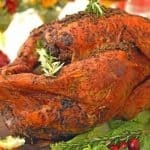 Roasted Savory & Citrus Turkey from Platter Talk is made with a couple of ordinary herbs and common fruit. The finished product is anything but ordinary. This Citrus Turkey has taste and flavor that you won’t ever forget. Roasted Savory & Citrus Turkey will make a start out of you this holiday season. This Roasted Savory & Citrus Turkey begins with an incredible mixture of fresh savory and citrus seasoning. For this Citrus Turkey, we used some fresh rosemary, some fresh thyme, and the zest from a couple of oranges and a couple of lemons. Together with some salt, pepper, and garlic, a dry rub is created. The bird is then allowed to rest, uncovered, overnight in the refrigerator. Fresh ingredients make this Citrus Turkey simple and delicious. The usually savory aromatics are added to the pan to flavor the drippings from this Savory & Citrus Turkey. Carrots, onions, celery and some apples are dispersed in the pan, beneath the turkey. Fresh squeezed orange juice from the zested fruit is added mid-way into the roasting process, along with a quick surface bath of melted butter. 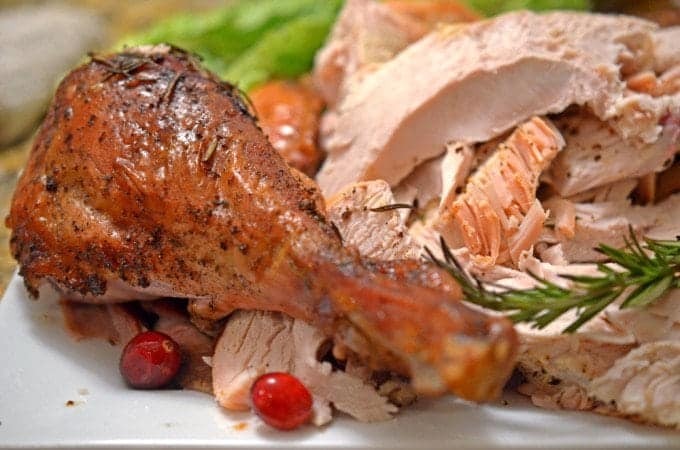 A combination of fresh savory and citrus flavorings make this turkey taste great. The result of this process gives a rich texture and dynamic flavor to this Citrus Turkey. Indeed, several guests proclaimed this the best turkey they’ve ever tasted. I wasn’t a guest but rather the host, and before any of them made that proclamation, I had already thought it. 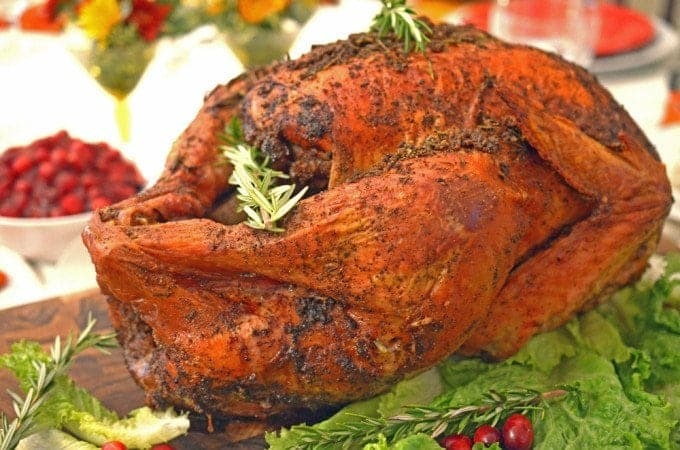 Please give this Savory & Citrus Turkey Recipe a try. What’s your preference: White or dark meat? 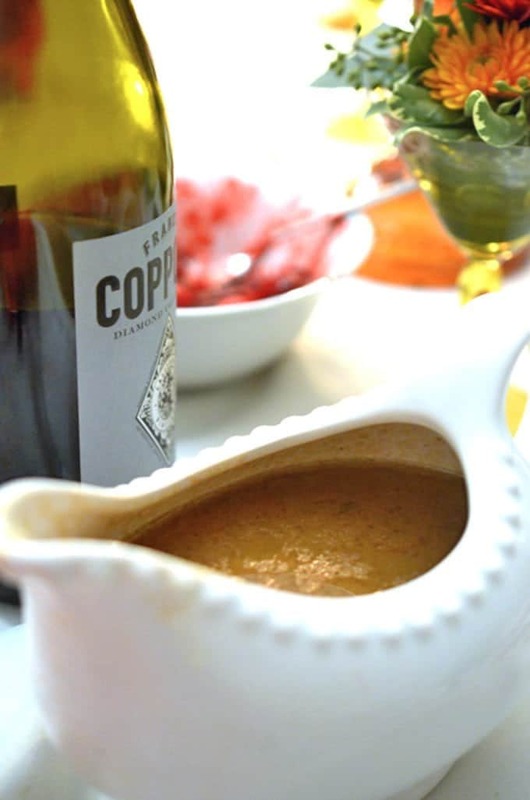 Be sure and try the Rich Roasted Turkey Gravy that goes with this Turkey Recipe! Remove giblets from inside the turkey; reserve for stock or gravy. Pat meat dry with paper towels. In a small bowl, stir together salt, pepper, allspice, garlic and citrus zests. Pat mixture all over turkey and turkey parts (including inside the whole turkey cavity). Stuff one bunch of rosemary in cavity of whole turkey. Strew remaining rosemary and the thyme all over turkey and turkey parts. Refrigerate, uncovered, overnight. Remove turkey from the refrigerator 1 hour before you plan to cook it so it can come to room temperature. Heat oven to 350 degrees. 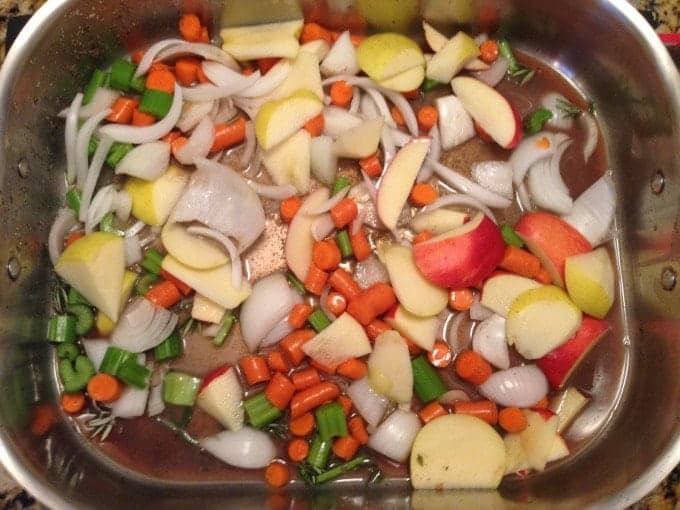 Distribute onions, carrots, celery and apples into pan, scattering them on the bottom of the large roasting pan under the turkey, and pour 1/2 cup wine in the bottom of the turkey pan. 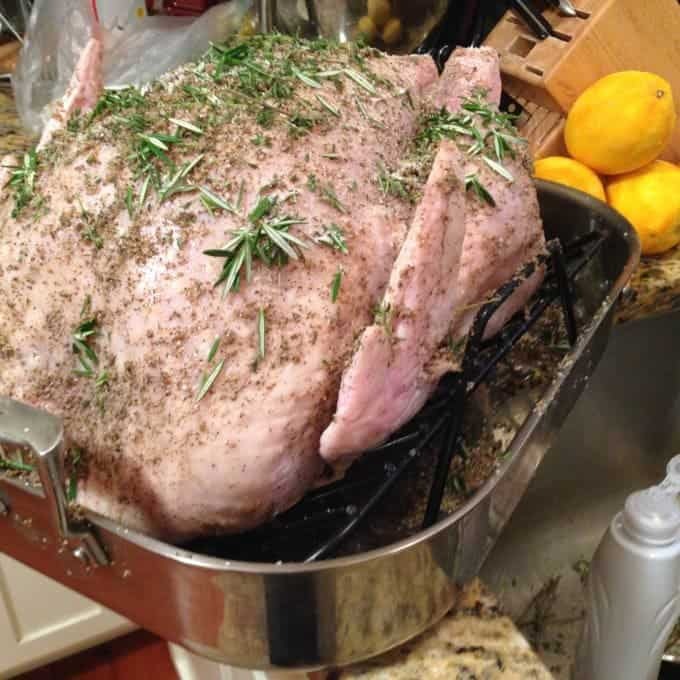 Place turkey (with herb branches clinging to it) on a rack in a roasting pan. Transfer whole turkey to the oven and roast for 1 hour. Squeeze the juice from the 2 zested oranges. Increase oven temperature to 450 degrees and place orange juice into the bottom of each of the pan. Drizzle the butter or oil all over the whole turkey. Continue roasting until an instant-read thermometer inserted into the meat registers 165 degrees, about 20 to 30 minutes more. (Note: The turkey breasts may cook faster than the dark meat, so keep your eye on them.) If the breast of the whole turkey starts to look too brown before the bird is cooked through, cover it loosely with foil. When the whole turkey is cooked through, remove from oven, cover with foil and let rest for 20 minutes while the parts finish cooking. That is perfectly roasted flavorful turkey. great addition to thanksgiving table. Since we are only 4 I buy only turkey breast. But your recipe making me to tempting to roast a whole turkey. I love pairing fruit with my roasted meat dishes too. I love the color you have on this bird so appetizing. Saving this for later. I wish we had turkey more times throughout the year. The bird tastes so good and it is good for us too. And then, not to mention all the great dishes you can make with the leftovers. Your bird has a gorgeous golden color and the savory and citrus flavor you gave it makes my mouth water. the color of this bird is fabulous! I just love the marinated citrus and the flavors must be over the top and juicy bird! Brining your turkey is the secret to extra deliciousness. Love how perfectly golden brown and packed with so much flavor. A gorgeous holiday centerpiece for sure! Now that’s a turkey for center stage on the holiday table!! Look how amazing it is! I’m nearly drooling from thinking about all those flavors combining. Citrus seems like a really fun addition for a turkey! That color is also so rich and deep. It looks like the skin is browned beautifully. That is one gorgeous looking bird! I never would’ve thought to do an overnight brine with citrus and apples, but it looks amazing! I love how you marinated the turkey overnight. My mom often did that. I barely ever remember to do it a few hours. I must try this. Love the color on that bird. Well it seems like we both have a similar idea. Our bird has a Tex-Mex flavor with the brine. It is super delicious as it looks like yours is too. We really look forward to our turkey meal — I bet everyone does the same for yours — the color on it is gorgeous. I absolutely love fruit paired with turkey, but have never tried oranges and lemons – sounds so delicious! Your recipe is really unique. This is a great dinner for my family. Very nice presentation. I’m sure it’s incredibly delicious! Thanks for sharing this great recipe. Woah that turkey looks soooo packed full of flavor. I’ll have to try this one out for sure! Yummy! I bet the oranges and lemons make this turkey really succulent and delicious, must try! oh what an incredible looking bird and the citrus must keep this so juicy and flavorful! OMG I love how juicy and flavorful this turkey sounds. Is there space for me at your table for thanksgiving!?!? Absolutely, we always have room for 1 (or 10) more! 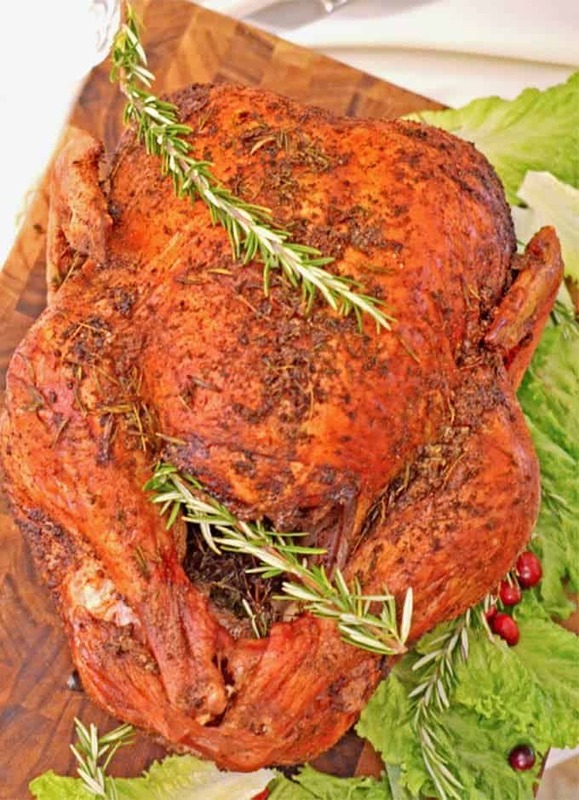 I love the idea of a citrus herb-infused turkey for thanksgiving, looks delicious! All of those herbs look amazing! Can’t wait for Turkey Day. Thanks, Michelle. It’s always amazing what “fresh” can add to any recipe! Oh boy. Do you deliver? That could always be arranged! Such a beautiful turkey! I love the addition of orange and lemon zest. Such a unique flavor for Thanksgiving! Tis that turkey time of year. We love it here, and this looks great. I love buying a HUGE turkey so I have lots of leftovers. I could eat it all year long. This sounds absolutely wonderful!! I love the citrus flavors in this – show stopper!!! Your turkey looks amazing. I’m sure it tastes even better with all the fresh herbs! Thanks for the comments, the turkey is every bit as wonderful to taste as it is to see! This looks like an INCREDIBLE turkey! Oh my! I love the flavor combinations of the citrus, wine, veggies, and spices. I am sure it is absolutely delicious. Thanks, Katie. Truly, the best turkey I’ve ever tasted. I was just about the ask the same question as Elizabeth above! Does a little orange juice and zest turn the turkey so red? It’s such an unexpected unique color! Julie, it’s all in the beauty and taste of drizzled butter, as the turkey roasts! Thanks so much for the great question. Elizabeth, thanks for the great question and truly one that I should have addressed. The deep, rich color comes from the drizzled butter that coats the turkey as it roasts. This not only gives it a gorgeous visual finish but adds an understated and sweetened finish to every bite.